Thank you to all of those individuals noted below, for your commitment and loyalty to the Company, and welcome to the Airflite 20 Year Club. Airflite is privileged to have been chosen by all these individuals as their primary place of work for a significant portion of their working lives. Their commitment and loyalty cannot be overstated. This commitment and longevity provides the organisation with a backbone of consistency, knowledge and effort that is critical to ongoing success. Over the 20 years there have been many great memories created and shared, and many wonderful friendships formed. Airflite is a Registered Training Organisation (RTO) operated by a dedicated Training Department. This RTO supports internal training requirements such as Human Factors Initial and Recurrent Training, and various Maintenance Process and Procedures Training designed around the various airworthiness approvals held by the Company. Additionally, type training is provided by the RTO in relation to the Pilatus PC-9 Platform. Airflite’s RTO is able to design and deliver courses for specific purposes. Training Rooms at Perth Airport are also available for ad-hoc use, seating up to 30 people. 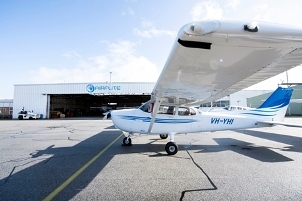 Airflite also operates a CASA, CASR Part 141 and 142 approved flight training organisation, building upon Airflite Pty Ltd.’s reputation as a leading Asia/Pacific Aviation Solutions Provider. Please contact our HR department to find out what positions are available.